When deactivated, a lightsaber appears as a metallic handle, lined with control buttons and lights. Upon activation, the energy contained within is fully released and generates as a shaft of pure energy about one meter long. Humming a distinct sound, the lightsaber’s shimmering blade is capable of slashing through anything except for another lightsaber’s blade. In the hands of a Master, a Jedi lightsaber is nearly unstoppable. Lightsabers can be used to cut through blast doors, enemy droids, and even charging space fighters. Using the Force, a Jedi can predict and deflect incoming blaster bolts, and reflect them back at the firer with a swing of his lightsaber. 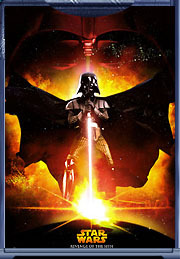 Although use of the lightsaber was reserved to the Jedi, the only ones trained for handling the difficult weapon, it was also mastered by their mortal enemies, the Sith Lords. 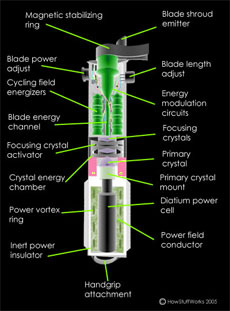 The Jedi lightsaber’s color depends on the nature of the Adegan crystal it comes from, and while its length is fixed in the case of a single-jewel lightsaber, lightsabers equipped with multiple crystals can have their length varied by rotating a knob that allows the focusing crystal activator to subtly modify the refraction pattern between the gems. During combat, the power cell streaks through a positively charged continuous energy lens at the center of the handle. The beam arcs circumferentially back to a negatively charged high energy flux aperture. A superconductor transfers the power from the flux aperture to the power cell. 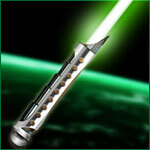 As a result, a lightsaber only expends power when its blade cuts through something. So efficient is the blade, that it does not radiate heat unless it comes into contact with something. After the elimination of the Jedi order, lightsabers became rare relics. The knowledge of their construction faded along with their masters. It was only Luke Skywalker, the last of the Jedi, built his own lightsaber at the end of his training.